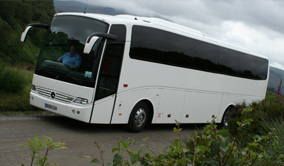 We provide coach hire services in Stirling as well as across Scotland and the UK. At Kingshouse Travel we pride ourselves on our large range of coach hire services. Based just outside Stirling, Scotland - we offer a wide range of coaches from our fleet, from 24 to 53 seating coaches for private, executive and contract hire across Scotland. We provide coach hire services in Falkirk as well as across Scotland and the UK. We provide coach hire services in Perth as well as across Scotland and the UK. We provide coach hire services in Glasgow as well as across Scotland and the UK. We provide coach hire services in Edinburgh as well as across Scotland and the UK. Our coach breaks are the perfect way to relax and explore the UK. We've a wide range of breaks and dates to choose from including fun filled themes parks with record breaking rollercoasters to relaxing shopping days. Please note that our coach breaks will recommence in May 2012. 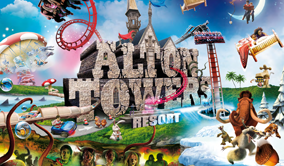 We own and operate altontowerstrips.com - the largest operator of Alton Towers Resort coach trips from Scotland. Working with our key partners we operate the largest day trip program from Scotland with prices from £50 per person. Welcome to Kingshouse Travel – One of Scotland’s Leading Coach Hire & Travel Management companies. 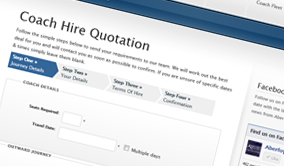 We specialise in providing coach hire quotations and providing travel management solutions across Scotland and the United Kingdom. We offer a wide range of coaches for hire, from 24 to 53 seating vehicles for private, executive and contract hire across Stirling, UK and Europe. Our Day Breaks & Short Breaks by Coach are the perfect way to relax and explore the UK, we've a wide range of breaks and dates to choose from. Transporting bikes & bags is no easy task - That's why every year people entrust us to transport bikes & bags across the Rob Roy Way and the rest of Scotland on their behalf. Our prime coach hire location in the heart of Central Scotland means we are close to several major towns and cities including Glasgow, Edinburgh, Stirling, Perth, Falkirk, Grangemouth, Cumbernauld, Larbert and Alloa. We offer a wide range of for hire from our fleet, from 16 to 53 seating vehicles for private, executive and contract hire across the UK and Europe. Our flexible approach to business and our innovative use of technology in our modern and expanding business has put us ahead of our competitors and has helped us establish our excellent reputation with our large customer and client base. When thinking about coach and mini-bus travel, think Kingshouse Travel. We have years of coach travel experience.